The Ricoh MP C2004ASP is a full colour, multi-functional printer, well suited for use by almost any office workgroup. It has capabilities to print, copy, scan and fax. 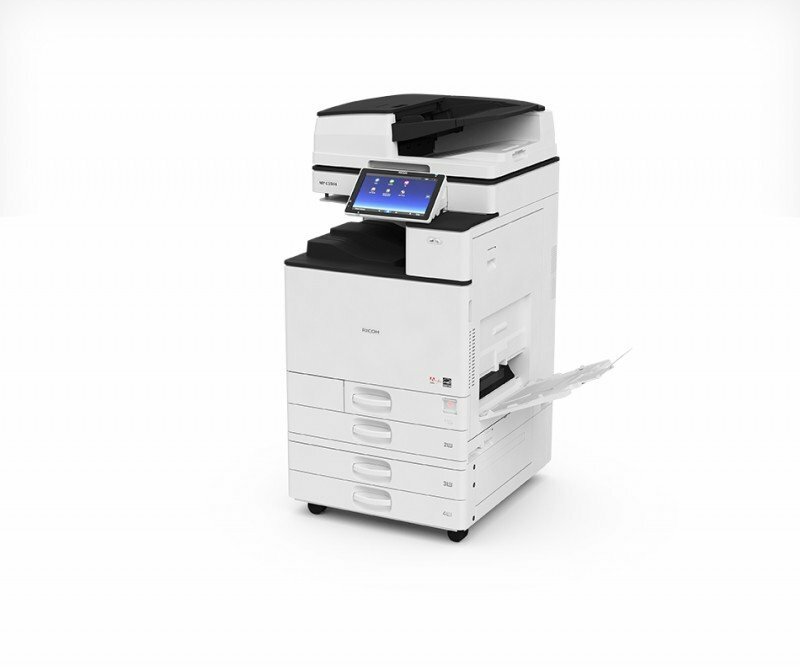 Useful features, such as an attractive and intuitive touchscreen control panel and excellent paper handling, put this printer ahead of the competition. This printer unfortunately takes a while to warm up and copy resolution is at a standard measurement. The Ricoh MPC2004ASP printer weighs just about 83kg. It measures 587 x 685 x 788mm. It features a large and intuitive colour touchscreen that measures 10.1 inches. The large paper tray handles allow for a good grip and the black and white colour scheme helps it fit in any office setting. The Ricoh MP C2004ASP is a colour, multi-functional machine. It prints quickly, at around 20 pages per minute in colour or black. The black toner yield is impressive, at around 15,000 prints. Cyan, magenta and yellow colour cartridges yield about 9,500 prints each. Print resolution is outstanding, at up to 1200 x 1200 dpi. Even the scanner resolution is up to 1200 dpi. Single-pass duplex scanning is another advantageous feature, since it allows scanning both sides in one pass, quickly. The SD slot, wireless and Bluetooth capabilities make work life easier. With its sleek finisher options, such as booklet finisher and automatic document reverse feeder, this printer allows you to keep your collating in-house. To top it off, this multi-functional machine has a 2,300-sheet paper input capacity. Unfortunately, the Ricoh MP-C2004ASP printer takes around half a minute to warm up. It doesn’t hurt productivity, but you will have to wait at the printer for a few moments. The copier resolution is only about 600 dpi, and while this is lower than the print resolution, it is very standard.